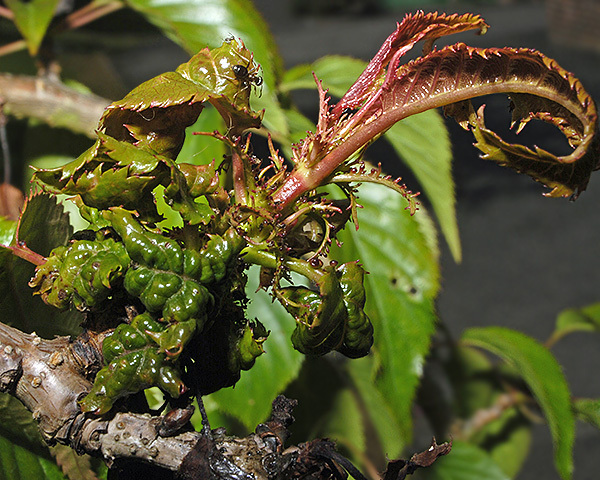 On its primary host Myzus cerasi cause the leaves to curl and produce ant-attended leaf nests (see first picture below). 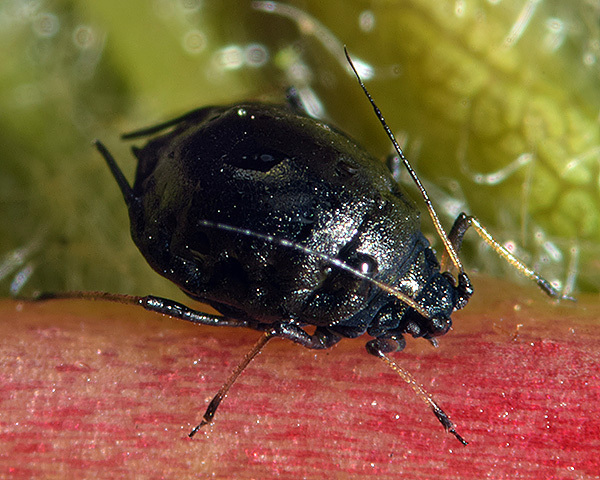 The adult aptera that lives in the leaf nest on the primary host is a small to medium sized aphid, shiny, very dark brown to black with a sclerotized dorsum. The legs and antennae are yellowish and black and the cauda is brown. The siphunculi are cylindrical and black with the distal part slightly curved outward. 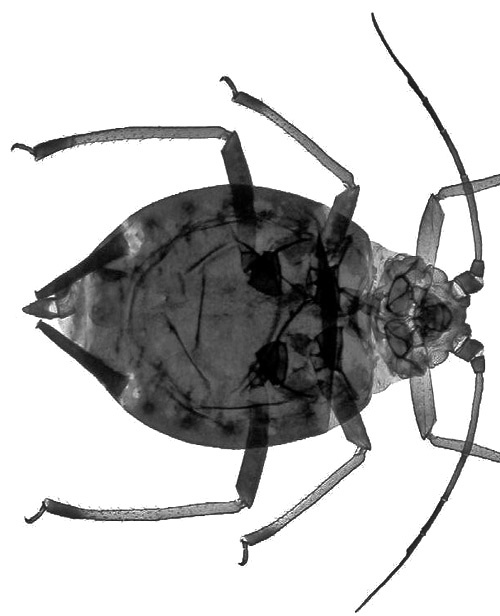 The body length of Myzus cerasi apterae is 1.8-2.6 mm. The clarified slide mounts below are of adult viviparous female Myzus cerasi (on primary host) : wingless, and winged. Most populations of the black cherry-aphid host alternate migrate from cherry (Prunus cerasus, Prunus avium) as the primary host to bedstraws (Galium), eyebrights (Euphrasia) and speedwell (Veronica spp) as the secondary hosts. However, colonies can be found on cherry throughout the summer, and these are sometimes given the status of a subspecies, Myzus cerasi veronicae. Forms on Prunus cerasus and Prunus avium are also sometimes considered as different subspecies or even species. The return migration occurs in September-October. It is distributed throughout the palaearctic zone and is now almost cosmopolitan. Myzus cerasi is avidly attended by ants. The colony below was attended by Myrmica rubra. Gruppe (1990) looked at ant associations with Myzus cerasi in Germany. 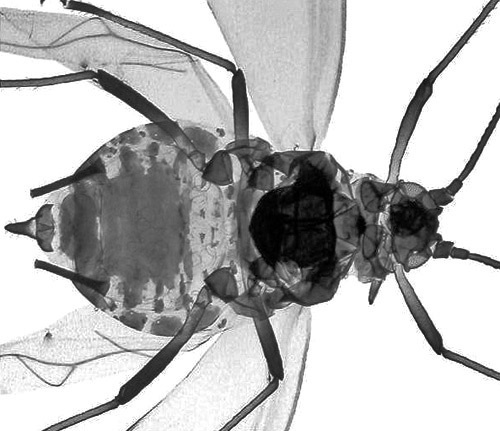 The trophobiotic association of Myzus cerasi with ants was not obligatory, colonies of the aphid being found without ants. Lasius niger and Myrmica laevinoides were the commonest species found with Myzus cerasi. Keeping ants away from cherry trees using sticky bands resulted in the development of fewer colonies of the aphid compared with untreated trees. 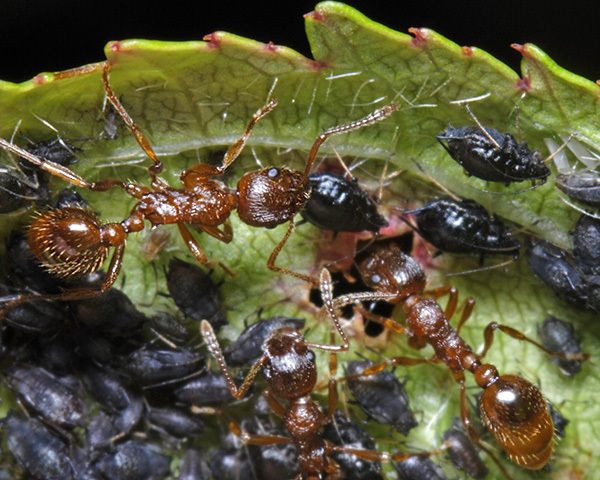 On trees with ants, development of aphid colonies started from the central part and spread to many adjacent buds and shoots, where new colonies formed. Only isolated colonies occurred on trees without ants. The colony above was attended by Lasius niger. Blackman & Eastop list Myzus cerasi as found on 33 Prunus species worldwide, and provide formal identification keys. Of the 19 species of aphid on sour cherry (Prunus cerasus) Baker (2015) lists 10 as occurring in Britain: Aphis aurantii, Aphis gossypii, Aphis spiraecola, Brachycaudus cardui, Brachycaudus helichrysi, Hyalopterus pruni, Myzus cerasi, Myzus ornatus, Myzus persicae and Rhopalosiphum nymphaeae. Of the 16 species of aphid on sweet cherry (Prunus avium) Baker (2015) lists 12 as occurring in Britain: Aphis fabae, Aphis spiraecola, Aulacorthum solani, Brachycaudus cardui, Brachycaudus helichrysi, Macrosiphum euphorbiae, Myzus cerasi, Myzus persicae, Nearctaphis bakeri, Rhopalosiphum nymphaeae, Rhopalosiphum padi and Rhopalosiphum rufiabdominale. We especially thank Plumpton College and Sussex Wildlife Trust for permission to sample.